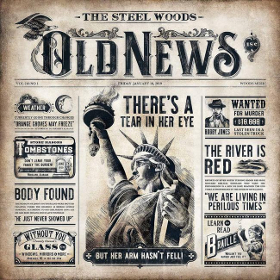 If you’re a Southern rock fan, and your haul from Halloween and Christmas leave you feeling short changed, wait until January 18th when The Steel Woods unleash their second album Old News upon the world via Thirty Tigers/Woods Music. Formed around singer/guitar player Wes Bayliss and guitar player Jason “Rowdy” Cope, this hard-driving Southern rock band can do Black Sabbath covers in a Southern drawl, while sending crowds crazy with their own original tunes. The two met at a one-off gig in Nashville, and after a fishing retreat together, decided to give something new a shot. Now they comprise the primary songwriters of The Steel Woods, with bass player Johnny Stanton, and drummer Jay Tooke filling out the roster. 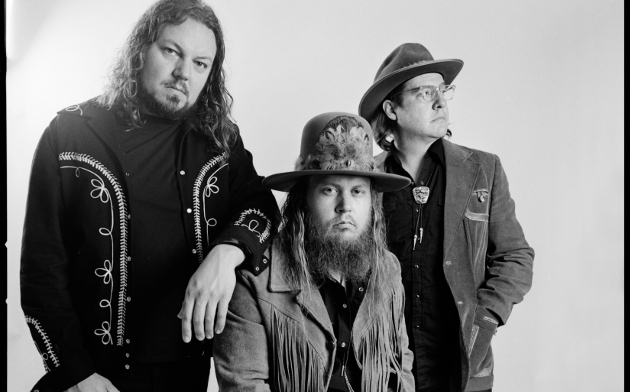 After releasing their debut album Straw in the Wind in 2017, The Steel Woods immediately shot up the Southern Rock depth charts, aided by big opportunities opening for Blackberry Smoke, Miranda Lambert, Cody Jinks, Jamey Johnson, and Dwight Yoakam. Now they look to take another big step with the new album recorded at the Echo Mountain Studio in Asheville, North Carolina, and Blackbird Studio in Nashville. Along with a bunch of new originals, the 15-song record includes a serious selection of covers that the band releases in tribute to some of the artists who directly influenced their sound, and have recently passed on. This includes “Whipping Post” by Gregg Allman, Tom Petty’s “Southern Accents,” “Are The Good Times Really Over” by Merle Haggard, “The Catfish Song” by Townes Van Zandt, “Changes” by Black Sabbath, and “One of These Days” by slain country music artist Wayne Mills, who was a close friend of Jason “Rowdy” Cope. But The Steel Woods wet your whistle with a brand new original, and the title track off the new album (listen below). A stone cold and blistering tune delving directly into the political divide ripping apart the fabric of the United States, no track could be more timely than “Old News,” and its release feels a bit more important than your average lead single. The Steel Woods will be on tour with Cody Jinks leading up to the release (check dates), and Old News can now be pre-ordered. I was luke warm on these guys until I saw them at the Tumbleweed festival and then they officially got me hooked. Everything about them is what you want in a Southern Rock band. So glad these guys and Blackberry Smoke are keeping this beloved genre alive. Support Southern Rock! Five stars on this band. They have “mood” in their music. It’s something that can only be felt and not explained. I think you can partly blame the dark chords they use, but it only works when the lyrics and stories are paired right with the music. What chords are you talking about? There’s minor chords strewn about most of their songs. but that’s in almost every song haha. Absolutely Smoke’N HoT Awesome Band!.. Love these Fine Folk’s.. just as kind as they are talented!.. Every time you see them! I would put them on stage Anywhere! Trig, y u no post my comments.??? They R my opinion. Just havin fun. U no fan of Seinfeld or Spomgebob? No, I was sleeping at 3 am, like you should be instead of posting inane stuff to these comments sections. How do you get your picture in there? Good song with a unifying message. Still enjoying their last album. Looking forward to this one. They were one of the highlights of this years Ref Ants Pants fest along with Dwight and Chancey Williams who I’d never heard of. Their set was probably the most energetic and Whipping Post gave me goosebumps. Really looking forward to both their originals and covers. Damn. That song is the love child of Lee Greenwood and Toby Keith, ain’t it? Hopefully they got that out of their system and the rest of the album will be a little less exuberant. Really liked their last album. I Hope “Old News” is not indicative of the writing direction they took for this one. I have high hopes for this album. Saw these guys live recently here in SC and they were fantastic. They did Whipping Post and it was amazing. If you haven’t heard Straw in the Wind (album) it’s worth a listen. The singer sounds just as good live as he does on the album. Great band! !